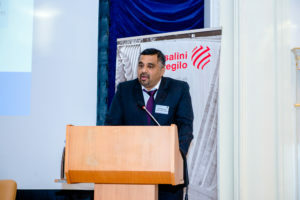 On February 19-20 AGL CEO Mr. Prashant Joshi participated in the 3rd Annual International Congress and Exhibition: Hydropower Caspian and Central Asia 2019 in Tbilisi. The event served as a professional venue for high-level participants to discuss key energy topics and exchange knowledge and experience for hydropower construction and operation in the Caspian and Central Asia region. Mr. Joshi gave presentation about the Social and Environmental Responsibility in the context of HPP construction and operation on example of the Shuakhevi hydropower project. More than 150 guests from different countries attended the Congress. The following day Mr. Joshi also joined a conference organized by Galt & Taggart and Bank of Georgia on Prospects of Energy Sector.